Amaryllis is a tender bulb that is native to tropical parts of South America. Amaryllis can only be planted, grown and propagated outdoors in United States Department of Agriculture (USDA) hardiness zones 8 through 10. In these zones, propagating and transplanting amaryllis can be performed completely outdoors. In colder zones, the bulbs and plants must be dug up and moved inside for the winter. Amaryllis grows best in an average temperature of between 70 and 75 degrees Fahrenheit for between 9 and 10 months. This period encourages vegetative growth and flowering. The bulbs then need to be stored for 2 to 3 months in 55-degree dry storage or under cool growing conditions. After they have grown for 2 or more years, the bulbs will begin to produce offset bulblets. Amaryllis propagation involves locating the bulbs that have bulblets. At that time, remove the bulbs from the soil for their cold storage period. After 8 to 10 weeks, the bulbs will dry out. Remove the bulblets from the parent bulb. In the spring, plant the bulblets in pots that contain an equal mixture of peat and perlite. Don't use pine bark as part of the medium; this can harm the bulbs. Wet the medium and keep it moist. Try to keep the temperature around the bulbs between 70 and 75 F. Once the roots and plants have grown in, they will be better able to tolerate temperatures as low as 65 degrees. Once the plant has started to grow, you can either grow the amaryllis in the pot or you can grow them outdoors. Place the entire contents of the pot into an outdoor hole to transplant. Removing the flowers after they start to wilt will direct more plant nutrients to vegetative and bulb growth. By directing more energy to the bulb, you will encourage bulblets. Once you have removed all of the flowers, remove the flowering stalk by cutting it off just above the bulb. Fertilization can provide additional nutrients to encourage bulb growth and division. 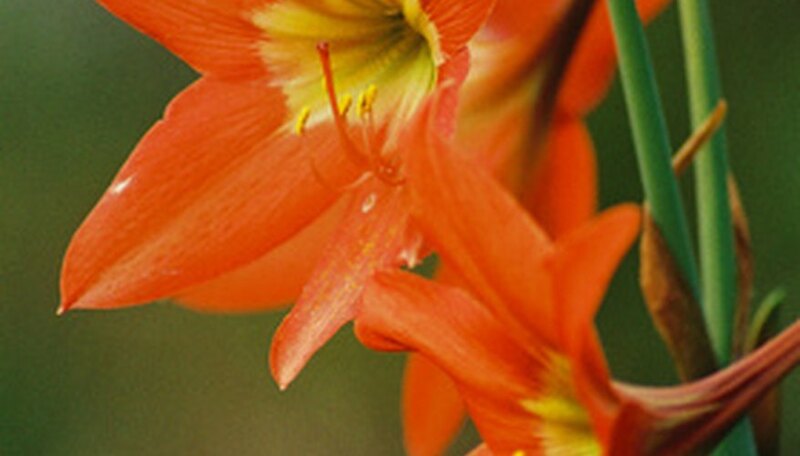 Fertilize your amaryllis with a balanced fertilizer as soon as the plants start to grow. Follow the the package instructions to avoid over-fertilizing. However, if the package indicates an acceptable range of fertilization amount and frequency, fertilize toward the heavy end of the range.